Mongolia is the world’s largest campsite and to come here without doing some sort of trek, would mean missing out on much of the nation’s connection with nature. Mongolians have lived as nomads for thousands of years and they are very proud of their nomadic way of life. Although they may think you’re crazy if you’re trekking on foot (rather than on horseback), they will admire your spirit and your love for the outdoors. Mongolians are industrious, kind and curious and they will likely invite you in or help you out along the way. 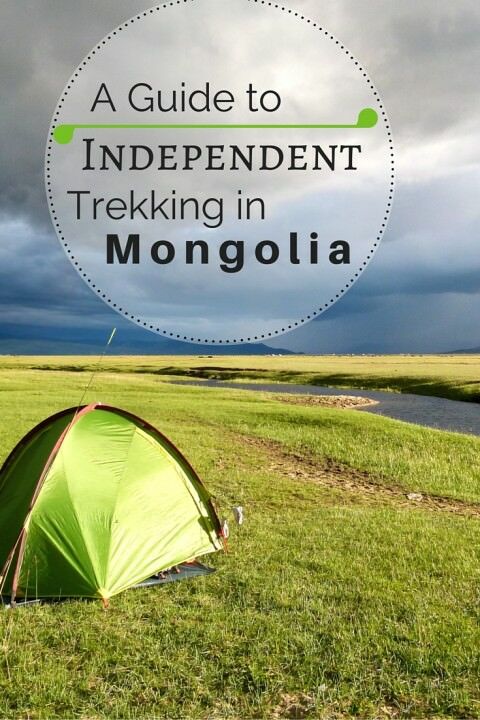 Traveling Mongolia is already an adventure, but doing an independent trek is icing on the cake! 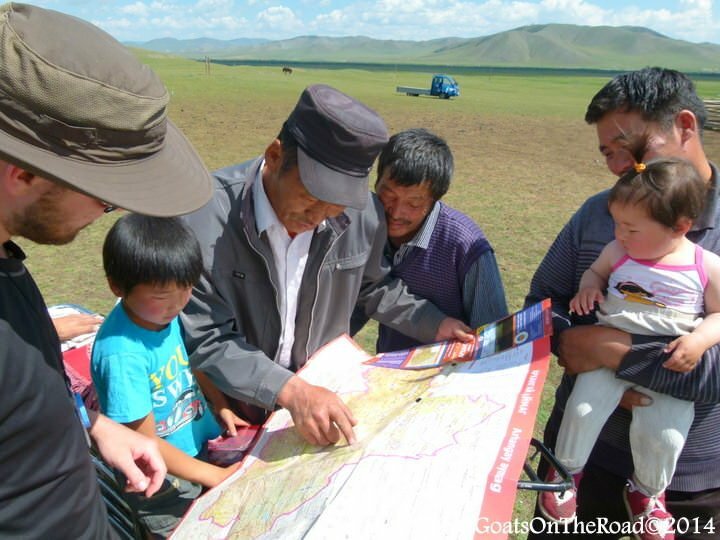 Even though many Mongolians can’t read a map, or speak English, they’re always willing to help! On Horse Or On Foot? This is entirely up to you. Horses are very affordable in Mongolia, a horse and guide will only cost you around $30-$40/day. Many travellers who have experience with horses come here and purchase a horse themselves. They saddle-up and head off to do some independent horse trekking! If you’re carrying a lot of weight, consider paying extra for a pack-horse to take a bit of the load off the horse that you are riding. If you’re like us and you love to walk, then trekking on foot is not only cheaper, but it’s better excercise. Either way you’re in for an amazing trip. Mongolia is full of great trekking opportunities, you just have to pick an area that best suits you. The Altai: If you have a lot of time (and some extra money) the western region along the Altai mountains is famed for its stunning natural beauty. There are plenty of rivers and lakes here that you can follow as well. Lake Khövsgöl: Here you can easily follow the shores of the lake or hike along one of the many rivers which enter this massive freshwater hold. 8 Lakes: Choose one of the many rivers leading to any of these lakes. Hike along Khuis and Shireet Lakes or follow the Baruun, Suv, Khug, Tamch, Uliastai or Orkhon Rivers. Alternatively, you can just trek them all! There’s also great fishing around here. Arkhangai Aimag: There are lots of treks to choose from around this incredibly scenic area. Consider following the Chulut River from Chulut Sum to Tariat, an excellent 120 km adventure that is truly off-the-beaten-path! Food For Trekking – What’s In Your Bag? You’ll have to figure out how you’ll be eating & drinking while you’re on the trek. We HIGHLY recommend Mountain House Foods for their delicious, lightweight, freeze-dried meals which only require you to add boiling water (get beef stew, mmm…). Reliable sustenance is another great reason to follow a river. You can use purification tablets and drink the river water, and you can also fish for your dinner (there’s great fishing in Mongolia). Vodka – Your stomach may not like Mongolian cheese & yoghurt that will be offered to you by local people along the way (although we had no problems). Vodka can help ease your belly. You can also dehydrate your own food if you have a food dehydrator at home. This is a lot cheaper than Mountain House Meals which are about $10 each. You can use your own recipes and a good, home-made chilli or beef stew would be great on the trail! 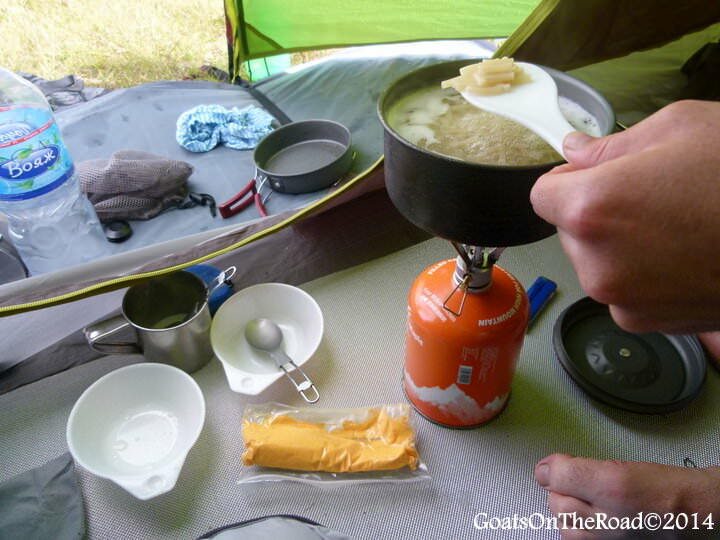 How Will You Cook On The Trail? 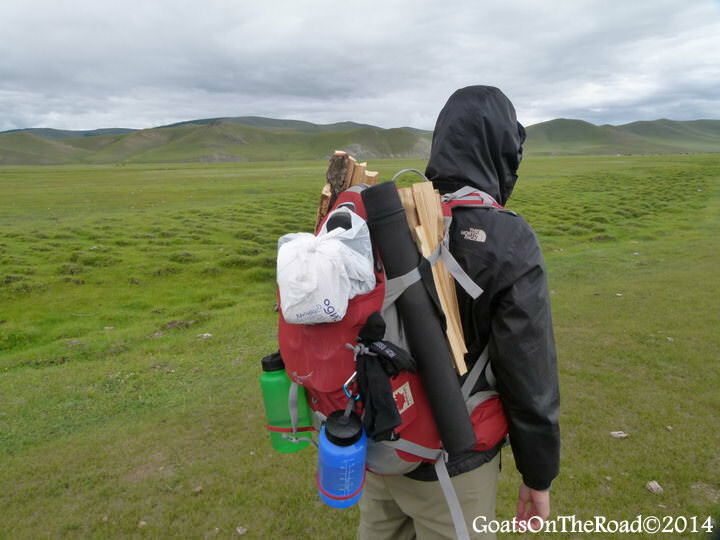 We highly recommend bringing a small stove on any trek in Mongolia. There are some forested areas where you will be able to find firewood, and some families may offer it to you, but you don’t want to rely on wood to cook your food. Much of Mongolia is grassland and you will only have cow dung for fires (which works well if it’s dry enough). We used the MSR Pocket Rocket Stove ($40) and it was great. It’s small, reliable, and boils water very quickly. The only downside is that there is no igniter, so you need to carry a spark of some sort. Pair the Pocket Rocket with a 16oz can of fuel (approximately 3 hours boiling time and taking 2 mins to boil 1/2L of water) and it’s all you need to cook 3 meals / day for most multi-day treks. Independent trekking requires a whole new set of packing lists and rules. Check out our Packing List for a Camping and Trekking Trip for a detailed run down of what you’ll need. **Make sure to get a cannister that will last for the amount of boiling you plan to do. Our 16oz fuel canister lasted our 8 day trek, and we had some fuel left over at the end. We didn’t boil water for drinking and had snacks and lunches that didn’t need to be cooked. Keep a lid on the pot to boil water faster and try to block out the wind. A Pot – You’ll need something to cook in, we used and recommend the Emergency Zone pot/pan set. Bug Spray – Bugs can be relentless at times in Mongolia. Moist Towelettes – There are no showers, the river may be too low (or too cold to bathe in) so these can be a life saver! A Knife Or Multi-tool – We suggest a good quality Leatherman with pliers. Duct Tape (Gaffer Tape For UK) – Amazing for fixing shoes, tent leaks or anything else that may come up. A Good Warm Sleeping Bag – Mongolia is cold year round. Get one that’s at least 0°c comfort level, yet is lightweight. A Ground Tarp – Makes for a useful ground mat, which helps for comfort and warmth. It also adds some extra rain protection. A Fishing Rod – Mongolia is one of the best places in the world for fly-fishing . Not only is it fun and something to do at the end of the day, but if you’re lucky, you’ll have dinner! Some Newspaper – If you decide to make a campfire, a bit of newspaper can do wonders for starting your fire. A Lighter – Seems obvious but you’d be surprised how easy it is to forget to bring a lighter. See Full Packing List Here. 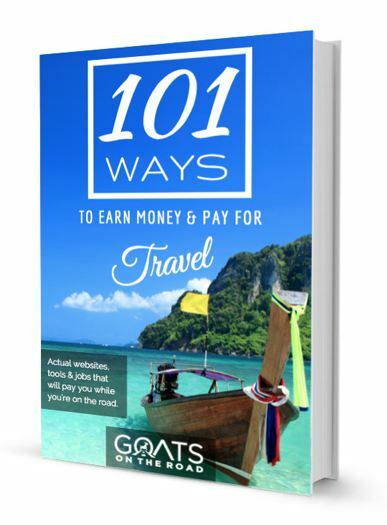 Will there be local people or nomadic families along the way that can help you out if need be? What will be your source of food and water? Is there a river or a lake nearby? Will you be fishing for food? Will the route be mountainous or flat? Will you have to zig and zag across various rivers, or is the route straight forward? Will you be in a forested area with wood that you can burn? If you won’t be bringing a stove, make sure there is some sort of wood where you’re going and bring some newspaper for easy lighting. How many hours/day can you walk? How many days will it take for you to get from point a to point b? 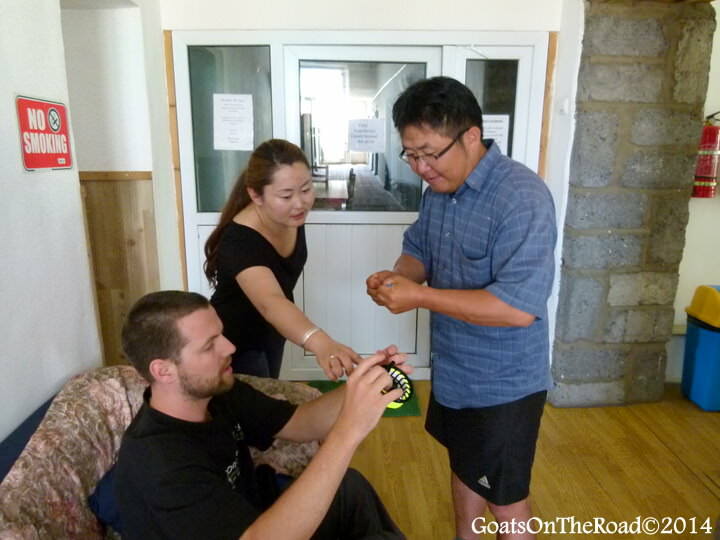 Always speak to local people when you arrive in Mongolia. They will have loads of advice for you regarding the route you’ve chosen. If you’re planning an epic trek in Mongolia, you should first plot your route. If you’re a novice trekker, then consider following a river so that you can minimize your chances of getting lost. You can use Google Maps to draw out a route and get an approximate distance of your planned itinerary. Google has a handy tool which allows you to draw a line on the map. As you zig and zag along your chosen path, Google will calculate the distance and time it will take to walk the trail. Once you’ve chosen a river or a route to follow, decide whether or not you’ll need a GPS unit, which will tell you your coordinates so that you can ensure you’re on the right path. You can pick up a GPS unit for cheap (under $100), or you can just use your smart phone. But again, if you follow a river, you probably won’t need to carry one. We highly recommend carrying at least a compass and a map. Note: Detailed, Russian made topographical maps can easily be picked up in UB. 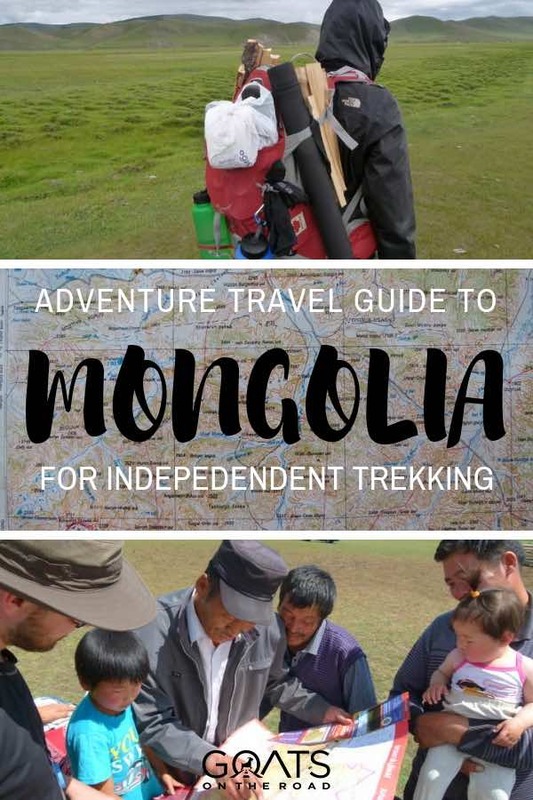 When planning an independent trek in Mongolia, you should know how to get in and out of whichever area you are in and it’s a good idea to have an emergency exit route planned if needed. As long as you plan most of your trek within a few kilometers of a rural road or settlement, you should be fine. When you’re testing out your bag, make sure it’s comfortable… really comfortable. You’ll be hauling it around for a long time. You also want to make sure to keep the weight down. If you typically carry electronics when travelling, leave them in a town you’ll be returning to. Don’t leave behind warm clothing though as the weather in Mongolia can be cold even in July & August. We used Osprey backpacks and they stood up to the task and felt extremely comfortable. I carried an Osprey Farpoint Series 55 and Dariece had an Osprey Kestrel 32. Make sure your bag has a waterproof cover, there are summer rains in Mongolia! 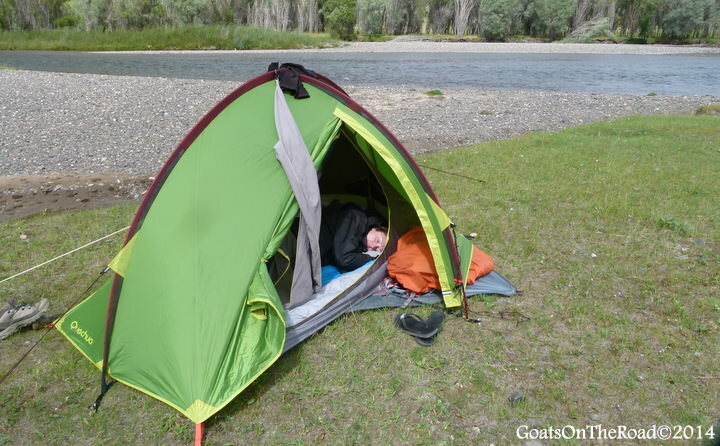 Check out our review of the Osprey Kestrel 32, and our review of the Osprey Farpoint 55. There are some excellent, light-weight tents available, unfortunately many of them are quite expensive. MSR makes a great lightweight tent called the Hubba Bubba. Our tent was the Quick Hiker II (2 person) tent by Quechua, and we loved it, although it was a bit chilly some nights. You could also check out the T2, 2 person tent. These tents are lightweight and completely waterproof. No matter which tent you choose, make sure it’s light (around 3kg), waterproof and comfortable. You don’t want to be crammed in a little damp cave when it rains on the steppe! Even if you’re a veteran hiker, you should carry a map and compass on the trail. Good maps and compasses can be purchased in Ulan Bator, but you’ll pay a bit more than if you bought them in your home country. Once you have purchased all of the appropriate gear for trekking in Mongolia, lay it all out and assess it, make sure you have everything you need and no more than you need. Do a test pack and make sure everything fits comfortably in your bag and on your back. Go through your food bag and make sure you have 3 meals a day for every day you’re on the trail, and then a few extras in case of emergency. If you’re planning on hiking for long hours each day, you’ll need heavier meals to keep your energy levels up. And now you’re ready to go! You’ve picked your route, planned your meals, bought your equipment and checked over your gear. Mongolia is the perfect place for anyone to don a backpack and some hiking shoes and go for a trek! You’ll be rewarded with amazing views, dazzling stars and friendly families along the way. You really couldn’t pick a better place to go trekking, so get ready… you’re in for an adventure. If you have any questions about trekking in Mongolia, leave a comment below! For more information on travelling to Mongolia, check out our NEW Guide to Backpacking Mongolia for information, tips and advice. For extra information, check out Mongolia Travel Advice. I love hiking, but horseback trekking in Mongolia has been one of my “must-do” travel items for years. I’m thrilled to know that it’s so cheap to rent a horse! Thanks for all the great tips! I’ll bookmark this post for when I eventually make it out that way. Glad to hear you found this article useful! Horseback riding in Mongolia is a must for sure. Even if you don’t do it for weeks, or months, we recommend at least getting out for a day on horseback. Mongolia is high on our travel wish list. We’re hoping to end up there next year. Trekking and horseback riding is why we’d want to go there. Super excited that you posted this article! Thanks! Awesome Jill! Mongolia was high on our list for such a long time, it took us almost 5 years to get to Mongolia after deciding we wanted to travel there. Trekking by foot and horseback are both great ways to see the countryside. 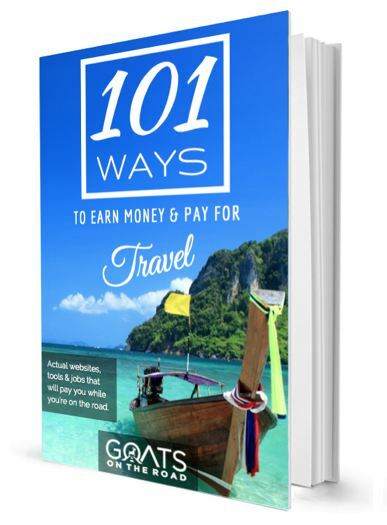 This guide is really detailed … with a few extra details, and some custom graphics, you could make an e-book product out of this (seriously). Mongolia is a trekker’s dream come true! Thanks a lot Larry. 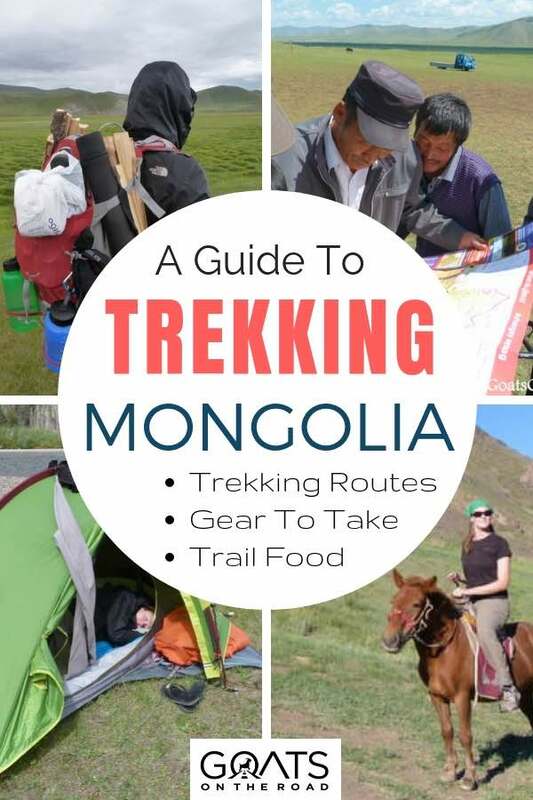 We’ll be putting together some ebooks in the near future, but not sure they’ll be on trekking in Mongolia 🙂 For now, our content is free for everyone! I like this detailed guide and am following your adventure around the world! I’d not thought about Mongolia before meeting a couple of people who said it was their favorite place in the world. It’s definitely up there on my list now. Thank-you for the practical advice! Mongolia is such a beautiful country, a great place to travel! Wow! I’d considered going to Mongolia, but I hadn’t considered the camping and trekking option. it seems like you would need a few weeks to be able to do this type of trek well in Mongolia. I’d love to do something like this for up to 1 week I think. Love the exhaustive guide that you guys have put together for newbies like my wife and I. Thanks for the post! You mentioned using a canister stove, and I’m wondering if you were able to procure fuel canisters in country? Most airlines will not let you fly with them. What other stove fuel is available in Mongolia? I am planning to fly into UB and then fly from there to Olgii to trek in the Altai. Yes, we purchased our fuel canister in UB, for the exact reason you stated 🙂 Enjoy your trek!! Thanks for the tips. I am taking a large(ish) group of secondary school students to Mongolia in about a month. I was just wondering if cheap trekking gear (i.e. fake down jackets & walking poles) are readily available in UB? Any suggestion about where to buy in UB would be much appreciated. There is a huge department store in UB, but none of the clothing is knock-off. We actually didn’t find any fakes, not like in Nepal! I would bring what you want, or, buy it there but it’ll be the normal price. I know it’s too late for you, Simon, but in case anyone else has this question: You can buy camping gear, clothing, fishing gear, and anything else you can imagine at the huge market in UB. It’s called the “Black Market” or Narantuul Market. Be really aware of pickpockets here. Hi, great article thanks for all the tips! I was wondering if you had any advice, resources or suggestions about finding a local guide upon arrival? 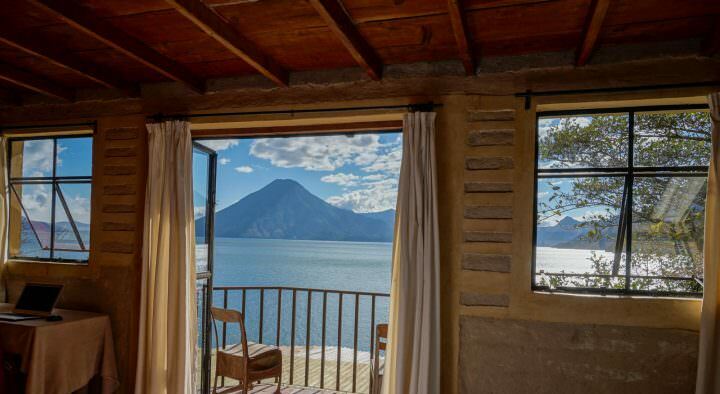 I am primarily interested in a few days to a week horseback riding trek but have found most of the tour packages online to be expensive. It seemed as though hiring a local guide upon arrival would be cheaper but I have been unable to find information on how to go about that. Definitely booking when you arrive in Mongolia is much cheaper. The online booking tours cost a fortune. I don’t have any names for you, but I would suggest asking around at your hostel or hotel when you arrive to see if they have any suggestions for you. Good luck! Mongolia is a great country for travelling. A few years later and we are hoping to do the same thing. 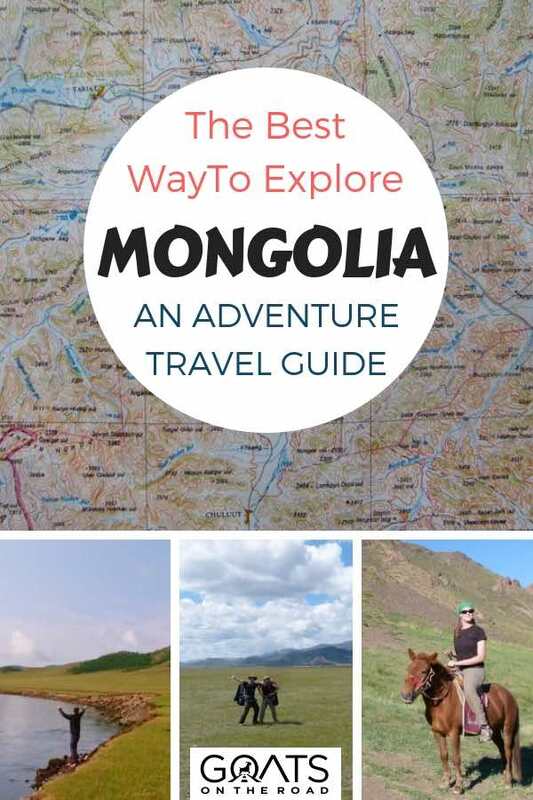 Did you end up going to Mongolia and did you end up finding a local guide on arrival? Amazing highlands, thanks for sharing your moment. I’m thinking on a solo trekking along Monoglia this August. It’s not my first one but my first on this awesome country. I’m looking for a trek about 10 days, non turisctic and with possibility of meeting local nomades on the way and if they let me, spend a couple of days with them. I don’t care, even I like, if there is mountains on the way. Do you have any recommendations for me? Thank you very much, you guys are awesome! We suggest doing as we did, which was to follow a river so that you have drinking water! Our trek along the Chuluut River was great and led us to White Lake. I’m not sure where else in the country you could trek – but there are MANY spots, we just looked on a map and then started researching. Cheers! I would like to ask you if it’s easy to get a ride on buses or hitchhiking from UB to Chuluut or somewhere close to that area. Thanks Goats! I keep popping back to this guide- it’s very inspiring. I hope this is OK to post a message to Alberto- I was wondering if he ended up going in August? First of all, what a great site :)! Me and my girlfriend love your well explained and detailed posts! In oktober we are planning to start our very own adventure and make our first world trip for a whole year. 1) How did you manage to know when you had to turn to the West instead of keep following the Chuluut river. Because we are not really experienced with compasses. What do we need to keep in mind for not losing sight and don’t get lost? 2) Did you have to cross over some rivers during your trek? On the topographic map we saw some small rivers on the side of the Chuluut river. so cool that you want to start your own adventure! Regarding your questions – make sure that you have a compass and map for sure, and a phone with data / internet if possible. We didn’t have that option at the time, but it would be good to have for safety reasons. You will want to study up and make sure that you are comfortable with a map and compass of course! https://www.youtube.com/watch?v=Y8ckrHq00aI&feature=youtu.be this video has some info. Keep in mind that it could be q bit chilly in OCtober, so you’ll want ot make sure you check the weather, and at the very least have a really good tent and sleeping bags. Hey there, love the page. I currently teaching English in South Korea and was thinking of doing a bit of horse riding and trekking in Mongolia for my summer vacation. I was wondering where abouts you would reccomend flying into, a starting point to find some hostels, meet potential guides? We have been studying your site like crazy ever since we booked our tickets to Mongolia a month ago. We leave on Friday, wondering if we need our big winter jackets? We have thermals packed, good rain jackets, a jumper etc.. Finding it hard to fit everything, especially when the jackets are thick. Well, we travelled to Mongolia in July / August and we didn’t have winter jackets, it was chilly at night, but a thermal, jumper and wind / waterproof jacket was all we had. You should be fine. And if not, you can always buy something when you’re there. 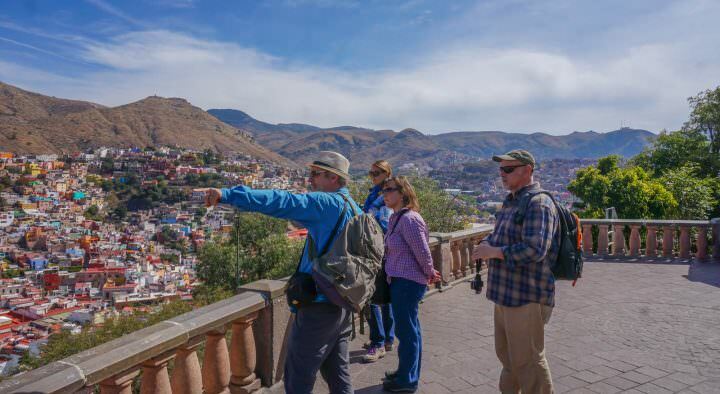 amazing….How much does it cost to hire a guide and a porter for a hike ? I’m not sure…we did this independently, without a guide. Love your blog! My husband and I would like to go here for some trekking in June. We have trekked Patagonia before and here in Canada so we are familiar with it. Just would like to know which route you would recommend? We definitely would like to do some fishing and would obviously like to see beautiful scenery and hopefully a few nomadic villiages.hoping to trek for around 4 days. Also is it quite safe there? And do you know if we can rent a tent etc when there? Also when you did your route your finishing location did you just bus back to the Capitol?Thanks so much for your help! We’re actually going to Patagonia in a month! Very excited 🙂 For Mongolia, we just chose a route on Google Maps. One that followed a river, had a few people along the way in case anything went wrong, and had us ending near White Lake. I would ask around at the guesthouse you stay at. Also, in Tsetserleg where we stayed at Fairfield guesthouse, the owners were really knowledgable about the area and gave us lots of advice. We even spoke to a local fisherman before heading out. I don’t think you can rent a tent unless you are on a tour – but I’m not sure. After we were done, we hitched a ride back to Tsetserleg and then took a bus to Ulan Batar. Thank you so much for this info. It is super helpful and really inspiring. I think I’ll be heading to Mongolia in July and had a few questions. Any tips for the fishing? What were you catching? Were you able to buy fuel for your stove in UB? I’m assuming this wouldn’t be a problem but did you see denatured alcohol? Finally, do you have a ballpark on how much it would cost to buy a horse? Thanks again! This is my intro to your blog and I’m looking forward to exploring a bit. Hi, thanks for all the good advice! I am planning a trek in Mongolia (Altai region) this July with my 2 sisters and am glad that independent trekking seems do-able. Do you have any suggestions for internet sites to buy maps? We would want 1:100,000 at least to help us plan a good route however I am struggling to find any for sale online. Thank you! Thanks for the great articles in this blog. I also plan a trip to Mongolia at the moment but it’s really difficult to find a good topo-map to plan any trip. 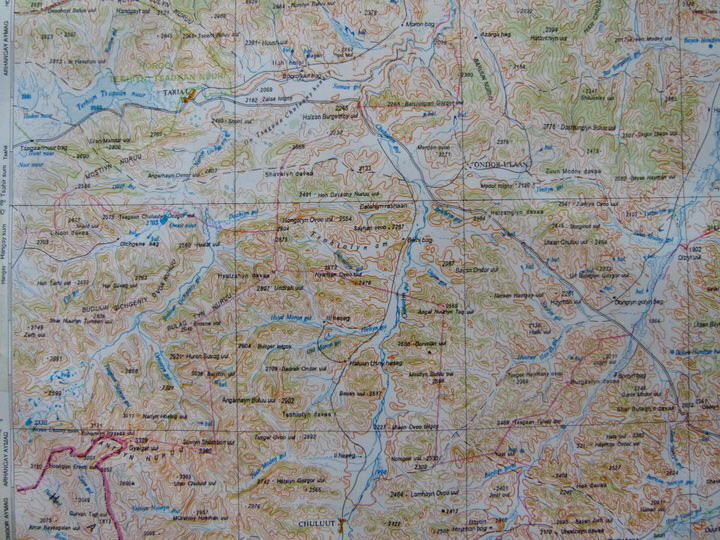 Where have you bought your map and is there any online store to organize a map before our trip is starting? It would be great if you could give me some hints! Could you go on an independnat hike for a week or so and just rent a pack horse to carry all your things? My main concern being feeding the horse.. It is a big dream of mine to backpack Mongolia on my own, but I am definitely a beginner. How would you recommend I prepare for this, physically, emotionally, logistically, etc? What are the tops things you would say to a person looking to prepare for this trip who also has zero experience? Thanks for the great information! This articles is a few years old. Just wondering if anyone has an update on the costs of hiring a guide and a horse. Is it still in the $30-40 per day range? Im wondering how easy it is to get fuel canisters in Ulan bator? I have a jetboil but is that going to be impossible? You mentioned food you had on your trek, did you buy that in Mongolia or were you able to bring food into the country on your flight? If so how do you recommend packaging the foods so this could be done?